English bulldogs are a very friendly and relaxed breed, but they also have quite a stubborn streak. There are plenty of tips and tricks to caring for your new puppy, but that stubborn streak can make training them a bit of a chore. Here are some ways to get your puppy’s training off on the right foot—err—paw. Bulldogs are great with people, but they can be more difficult with other animals. As a result, it’s best to start socializing them with animals as soon as possible. Take your new puppy to a nearby dog park, or safely introduce them to your other pets. Then reward your puppy with a treat during and after the interaction so it reinforces the positive experience. Taking your new puppy to an obedience class at your local PetSmart or Petco is a great way to train your dog and get them used to other animals. However, if you don’t want to spend the money, you can just as easily train your puppy yourself. Start with the basic commands—“sit,” “stay,” “down”—and reward them with treats and verbal praises. Keep the obedience sessions short, though, at no more than ten minutes a day. Crates should be safe and comfortable spaces for your new puppy, and he should feel well-protected inside it. Put blankets, toys, and food inside, and make sure it’s big enough for when your puppy is full-grown. It should be large enough for him to move around and stretch out, but not enough where he’d want to go to the bathroom inside. To train your puppy to go inside the crate on command, use the word “crate” while luring him inside with a treat. No one likes it when their puppy soils their new carpet, so it’s best to start potty training right away. Your pup will need a potty break every two to three hours, so be prepared and monitor his activity in between breaks to prevent any accidents. When two hours have passed, take your puppy outside to the same spot each time. After he’s done his business, give him a treat and then return back inside. 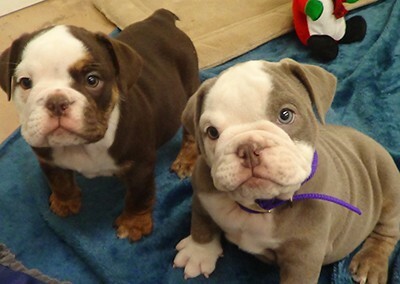 If you’re thinking of bringing home an English bulldog puppy of your own, Bulldog Angels have plenty of puppies still looking for their forever home. Contact us to find out more!